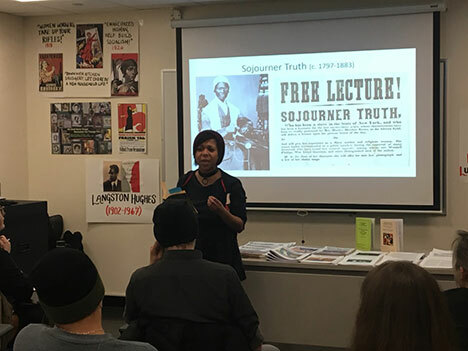 On March 8, International Women’s Day, the Spokane Marxist Group (SMG), based in Spokane, Washington, and the Marxist Student Group (MSG), leadership of the Marxist Student Union at Central Connecticut State University, fused with the Revolutionary Internationalist Youth, youth section of the Internationalist Group (U.S. section of the League for the Fourth International). The international working-class holiday – sparked by the strikes of immigrant garment workers on New York City’s Lower East Side more than a century ago – was chosen as the date for the fusion in honor of the fight for women’s liberation through socialist revolution and the Russian Revolution that began with mass strikes on International Women’s Day in 1917. The fusion into a single organization followed a period of common work, a high point of which was RIY’s Educational and Organizing Conference, held in January, where members of RIY, SMG and MSG gave presentations on their organizations’ political work and perspectives, and an SMG activist was a co-presenter of an educational point on the meaning and history of the “united front tactic” in the international communist movement. Presentations were also given by RIY members on Democratic Party feminism and the “#MeToo movement” (highlighting the counterposition between the class-struggle program for women's liberation through socialist revolution and feminism, which calls for “sisterhood" across class lines),1 on U.S. imperialism and the migrant caravan, as well as a history of the communist youth movement going back to German revolutionary Karl Liebknecht’s campaign against militarism before WWI. Following the three organizations’ unanimous vote to carry out the fusion, forums and celebrations commemorating International Women’s Day were held in New York City, New Britain, Connecticut and Spokane, Washington. Comrades made presentations on the Marxist program for women’s liberation and gave a rousing rendition of Langston Hughes’ poem “Good Morning, Revolution.” They also read speeches and writings by and about such heroes of the class struggle as Sojourner Truth; anti-lynching crusader and black self-defense advocate Ida B. Wells; Flora Tristan, a courageous early theorist of socialism, trade unionism and women’s liberation; Louise Michel, who was tried and deported for her role in the Paris Commune; Rosa Luxemburg, Alexandra Kollontai and Clara Zetkin; gay and transgender rights pioneer Magnus Hirschfeld, and others. A striking aspect of the New York event was the deeply moving talks by three women comrades from Trabajadores Internacionales Clasistas (TIC, Class Struggle International Workers), about the experiences and struggles of triply oppressed immigrant women workers and their vital connection to the fight for socialist revolution. The Spokane Marxist Group had its roots in the Spokane branch of Socialist Alternative (SAlt), U.S. affiliate of the pseudo-Trotskyist Committee for a Workers’ International (CWI). The high national profile of SAlt and its Seattle city council member Kshama Sawant, combined with SAlt’s status as the only left organization in Spokane until early 2017, led the founding members of SMG into its fold. While in SAlt, comrades who would later found SMG were active in organizing against racist deportations and against fascist groups like Patriot Prayer and the Proud Boys. 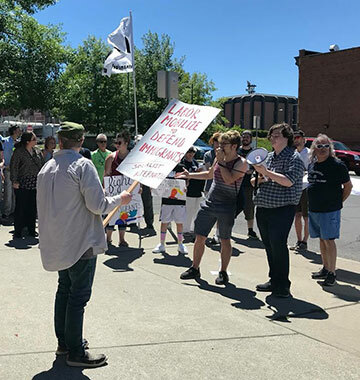 Of particular note was their leading role in the 7 July 2018 “No More Racist Deportations” demonstration at the Spokane Intermodal Center. 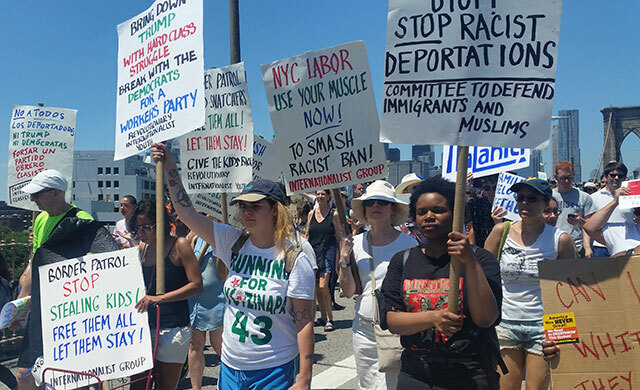 The event brought 80 people out in protest against the frequent practice of Border Patrol agents boarding Greyhound buses, where they racially profile suspected immigrants and demand to see their papers. This culminated in a two-hour occupation of the bus station. At the same time, founders of the SMG opposed the increasingly blatant class-collaborationism by SAlt, an organization whose claims to be Trotskyist were always false but were more and more openly exposed by its promotion of and support to Bernie Sanders’ presidential bid. In sharp contrast to the Marxist principle of working-class political independence, Socialist Alternative enthusiastically cheered on electoral victories for “progressive” Democrats and joined the rest of the reformist left in tailing after the Democratic (Party) Socialists of America.2 The SMG founders’ opposition to this resulted in their further investigating the CWI’s political origins and program, identifying the counterposition between genuine Trotskyism and this social-democratic current. This was summarized in the documents “Revolutionary Marxism Is Based on the Political Independence of the Working Class” (August 2018) and the resignation statement “Socialist Alternative Is No Place for Revolutionaries” (October 2018, reprinted in The Internationalist No. 54, November-December 2018). 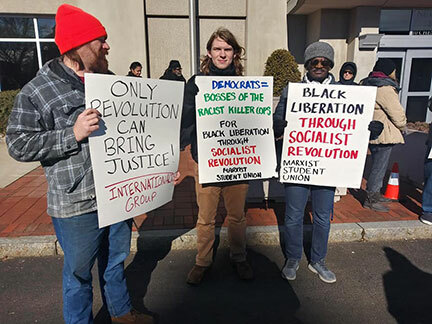 The Marxist Student Group, leadership of the Marxist Student Union at Central Connecticut State University (CCSU), emerged from the membership of the now-defunct CCSU Youth for Socialist Action (YSA), which was originally affiliated with Socialist Action (SA), another organization misusing the name of Trotskyism. (Emerging in the mid-1980s from the Socialist Workers Party, SA eternally sought to replicate the SWP’s “successes” in building antiwar popular fronts during the Vietnam War.) The SA-affiliated YSA, far from a Leninist youth organization, had a politically heterogeneous membership, winding up with no members actually supporting SA’s program. The young comrades who later formed the Marxist Student Group traveled a considerable political distance from their first engagements with political activism, which ranged from “Marxist feminism” to supporting Bernie Sanders’ 2016 campaign to variants of ostensible Trotskyism. 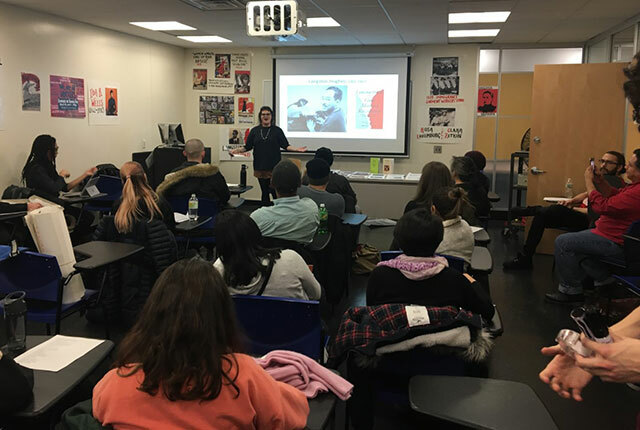 The CCSU YSA began to investigate the origins and history of the communist movement in the U.S., as well as the need to reforge Trotsky’s Fourth International (destroyed by the anti-Trotskyist political course that came to be known as “Pabloism” in the 1950s). This led them to move toward genuine revolutionary Trotskyist politics, which had been embodied for three decades by the Spartacist tendency and are upheld today by the IG/RIY. At the same time, organizational issues arose in relation to SA, which treated the YSA in a grossly bureaucratic manner. YSA was renamed Marxist Student Union to reflect the comrades’ Marxist politics and to distance themselves from Socialist Action’s reformism. The leadership of MSU began discussing with the IG and RIY soon after and engaged in a period of joint work, including participation in demonstrations, literature sales and other activities, and a forum on “Marxism, Gender and Sexuality” held at CCSU in December 2018. The fusion comes at a time when most self-proclaimed Marxist organizations in the U.S. have been thrown into crisis by the growth and prominence of the Democratic Socialists of America following the 2016 presidential campaign of Bernie Sanders and the election of Donald Trump. 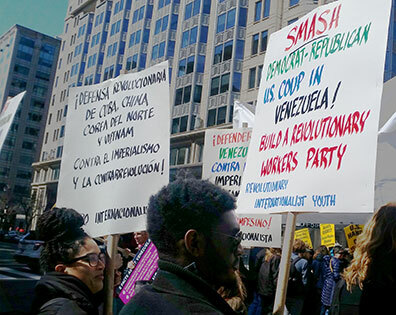 This has led these groups to jettison just about every remaining pretense of upholding class politics in order to tail after Sanders, Alexandria Ocasio-Cortez and other “progressive” Democrats, as these bourgeois politicians carry out their function of leading workers and youth back into U.S. imperialism’s Democratic Party. In contrast, RIY is a training ground for young revolutionaries committed to helping forge a revolutionary workers party on the basis of intransigent proletarian class opposition to all the parties and politicians of “our own” imperialist rulers – and to put an end to imperialism (the highest stage of capitalism) through international socialist revolution. For the program of the RIY, see: “Revolutionary Internationalist Youth Founded,” Revolution No. 14, January 2018). 1. See “Democratic Party Feminism and the ‘#MeToo Movement’” (January 2019). 2. For an in-depth study on the political origins and development of the DSA, see our 70-page pamphlet “DSA: Fronting for the Democrats” (2018), available to order online at http://www.internationalist.org/orderhere.html.